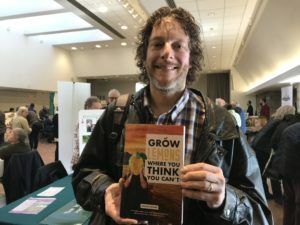 Steven Biggs and his new book on lemon growing. Author Steven Biggs is the gardener who convinced us that we could grow figs in our Canadian climate. Now his new book, Grow Lemons Where You Think You Can’t gives us the good news that we can grow lemons too, even in Canada. Steven’s serious interest in growing lemons began when friends gifted him with a huge, mature lemon tree they no longer had room for in their greenhouse. Steven had been growing a Meyer lemon plant in less than ideal conditions —not really knowing what he was doing—for a few years. The timing of the monster gift tree —along with better growing conditions— reinvigorated his lemon-growing enthusiasm. Eventually even his once struggling knee-high Meyer lemon tree allowed him to pick 50 lemons in one go. Steve was officially hooked on growing lemons, and this book is the result. Steve’s six reasons why lemons belong in cold climate gardens. 1. Lemon trees are forgiving. They can withstand a bit of neglect. Steve’s story above attests to that. 2. Lemon trees are cold hardy. A cool sunroom that stays just above freezing is a perfect situation for lemon trees over the winter in cold climates. He also talks about lucky gardeners in southern BC who can plant lemons in protected spots outdoors. 3. Lemons will actually ripen in cold climates. Sweeter citrus plants, like oranges, need sustained summer heat to ripen, but an acid citrus like a lemon doesn’t need that type of heat. 4. Pushing boundaries is a thrill. Many gardeners like the challenge of doing something that’s not supposed to succeed in their climate. And growing lemons give us this opportunity. Some mature lemon trees (that have been hardened off, not actively growing) can withstand temperatures of -6C. An example of this are Meyer lemons, which are the most cold hardy. 4. Lemons are a food crop. You might ask, why grow lemons when you can just buy them at the supermarket? Steven’s answer to that is that lemons are best when they are fresh. Whats the easiest way to store lemons so that they stay fresh? On the tree! And a plus is they last a long time on the tree. Steven picks lemons from his trees in February! And lemons give you more than just the fruit. Steven uses lemon leaves when he’s barbecuing, wrapping them around kebabs. The book has a recipes section for some great lemon uses. 6. You get flowers and fruit at the same time. You can enjoy the fruit and fragrance of blossoms year round. Grow Lemons is chock full of everything you need to grow lemons with information on watering, the right pots, soil, pruning, feeding, pests and overwintering. The book notes that lemons don’t make the greatest houseplants in our well-heated living rooms over winter. Leaves will drop, but the plant will live during its winter dormancy. A sunny, cool room is best for overwintering, a garage, cool, dark basement that preferably doesn’t freeze. If you have a cool sunroom or greenhouse, that’s ideal. As soon as it is warm enough outside, bring your lemon outdoors for the summer. The book also has a section on several home lemon growers around the world, from Canada, the UK to South Carolina, who share their own techniques and varieties. The recipes at the back are a great addition, and I’m eager to try them. This is the year I am definitely going to buy a Meyer Lemon.